Three days ago, this desk was immaculate! After more than three months of successfully (and futilely) avoiding all school-related activities, the fall session has finally caught up to me. Where has all the summer gone?! Like death and taxes, I guess you could say that it is just one of those inevitabilities for a seminarian. With the new year comes an entirely new experience. Whereas last year I spent countless hours studying philosophy, this year I will spend countless hours studying theology (a major improvement). 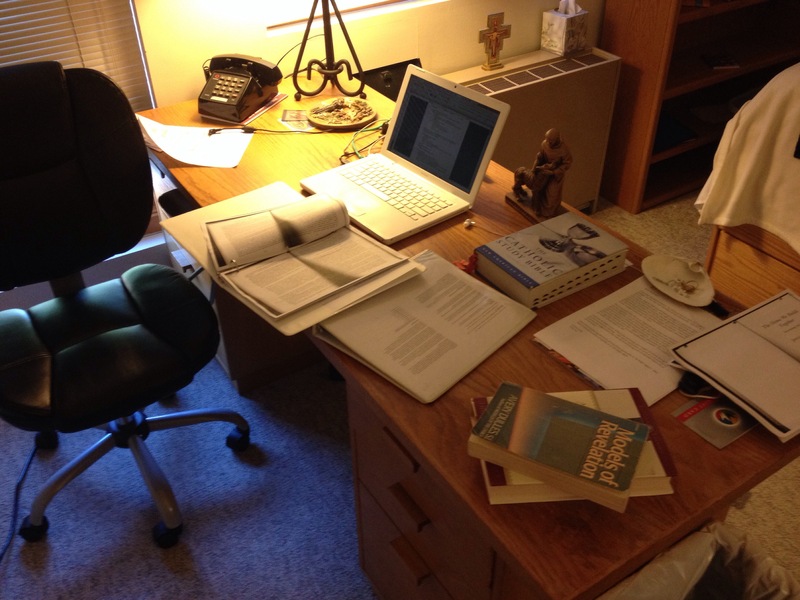 On Monday I officially started my degree for ordination, the Master of Divinity (M.Div.) In the next four and a half years, I plan to complete 103 credits of Master’s work in systematic theology, moral theology, biblical studies, pastoral care, history of the Church, liturgical history/theology/practice, and canon law, with a one year “break” for a pastoral internship somewhere in between. For those keeping score at home, that will be a grand total of 133 credits in nine semesters of work. Your prayers in this long endeavor will be greatly appreciated over the next half decade. But that’s not all that’s new. Whereas last year I spent the entire first semester struggling to transition from novitiate, I start this year with a level of comfort unknown to me last year. I know how to get to school and where my classes are, have already established relationships that I can fall back on, a regular schedule within and without the house, a spiritual director I can call and meet with whenever necessary, and a set of leisure opportunities (golf, movies, gym, restaurants) that I can get right back to rather than search for. Without having to establish all of these things in a new city like I had to do last year, my stress level is next to nothing at the moment. This, I might add, is a tremendous gift at the beginning of a difficult academic year. Lastly, whereas I taught two confirmation classes for 8th grade boys last year, ministering to a demographic that stretched me outside of my comfort zone, this year I will be working with campus ministry at Georgetown University, ministering to an age group that is a little bit more my speed. I’m not entirely sure what I’ll be doing yet, but I’m excited to be with young people in such a formative time in their lives in any way that I can. I have no delusions that the experience will be an easy one, but I look forward to the challenges ahead. For now, it’s off to do what I will be doing for the rest of the term, reading, completed with a late episode of The Simpsons with a few guys in the house (a show, I might add, shows its characters in church or discussing religious topics more than any show on television. Really. The Vatican Newspaper even praised the show once. Really! Maybe I can team up with my classmate Ed Tverdek, an avid follower of the show, and write an post about it. I digress…) Blessings on all of you this year, and for those in the academic world, good luck with all your studies! Tags: back to school, graduate school, M.Div., seminary, The Catholic University of America, Washington D.C.